What does the future have in store for you? Flying cars? Personal jet packs? Nope. But you do get robot bodies. That's according to Ray Kurzweil, director of engineering at Google. We're going to become increasingly non-biological to the point where the non-biological part dominates and the biological part is not important any more. In fact the non-biological part - the machine part - will be so powerful it can completely model and understand the biological part. So even if that biological part went away it wouldn't make any difference. We'll also have non-biological bodies - we can create bodies with nano technology, we can create virtual bodies and virtual reality in which the virtual reality will be as realistic as the actual reality. The virtual bodies will be as detailed and convincing as real bodies. But, do we believe him? Nope. He doesn't believe in the stuff he does himself. Go to his Google Plus page. Nothing on it. And he's Director of Engineering for Google! I kinda don't believe him either. But, suppose he's right. Would you want a robot body? Something like out of Blade Runner ? Or brains uploaded to computers? I'm not sure if I want to live forever. Of course, I'm not too keen on dying, either. "even if that biological part went away it wouldn’t make any difference." Um, I'm taking a wild guess here, but I'll bet he's had more circuit diagrams posted up on his walls than pictures of the Swedish Bikini Team. And what are the ethics of having Honey Boo Boo, Michael Jackson, or liberal politicians live forever? Paging Dr. Cooper; Dr. Sheldon Cooper - your cyborg is ready. It's already happened. But we didn't tell the dumb people because it would cause a panic. So if you don't know about it already you must be one of the... errr where was I? Nope, couldn't happen, load of rubbish I say! I planted some Robo-Basil and it took over my garden! Ray Kurzweil may be right in the longer term, but I don't think that what he's describing is going to be the case in a hundred years, let alone in the next twenty. Fortunately, I, like Basil, don't wan't to live forever, and, unlike Basil, am okay with dying. I’m not sure if I want to live forever. Of course, I’m not too keen on dying, either. could give new meaning to the phrase "getting a lube job". Robo-Basil in Basil's Bizarro World. * Robo-teeth - or - little pain, on-off dip switches for living teeth. * Implanted brain math chip for doing really fast, advanced math. * Vision-correcting, eyeball nanobots to give you 20-10 vision, but with the equivalent of bifocals! 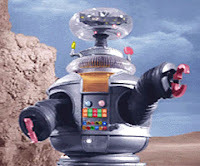 Hummmm...zzyzx the robot, yeah I like that. Oh Will, come hear boy. What, exactly, would be left of you? They think your conscious would be transferred to a device, but possibly your personality (and I'm sure it's a lovely personality, worthy of preserving) would be copied and you'd still be dead. So we'd have a machine that thinks it's Basil, Frank J, me, or---God help us all---Joe Biden. I think we'd better figure out what consciousness is before we start planning our robot futures. Well if they force me into a robot body, can it least be good looking and not like the one i have now? @FredKey: Kurzweil and his fellow proponents are quite smug about the continuity of self under such cases and grandly propose that since your brain replaces neurons as you age anyway such that they all get replaced eventually, swapping out real ones for Si ones won't be any more of a concern for that than what nature has already provided. 'Multiplicity' and 'The Sixth Day' may be crappy movies but they should be on these folks' watch lists -- and they prove that this is a good topic for IMAO because there's LOTS of humor potential here even if we're too PG to really explore what would happen when it's safe easy and cheap to retool any part of the human anatomy to new specifications. Basil -- yeah, when I get dropped into the robot they'll obviously have to ret... une my sense of shame. I'm sure it's part of the service, maintaining a polite society & all. Ooh! ooh! Can I get re"tooled"? Creating robots that are going to make so many wrong, bad, self-destructive and often illegal choices can only be a good thing. One accidental reply all by the NSA could fix any problem units though. What would I do with an immortal, indestructible robot body? Wait. What? Kill all humans? Personality is influenced by its container. Would Jimmy Durante have been the same guy without his nose? Would Marty Feldman have been the same without his distinctive eyes? Would Dolly Parton be the same person without her impressive...voice? (you thought I was going with something else didn't you?). Our bodies do not define us - but they do shape us. Johnny Winter and Michel Petruciani have cited their physical limitations as reasons for becoming professional musicians. Would Ray Charles have become a musician if he'd had his sight? Stevie Wonder? Maybe – maybe not. Would Stephen Hawking be who he is if he had the same body as Manny Pacquiao? Who would Arnold Schwarzenegger be if he been born with the physique of Jason Acuña. These people would all have the same intelligence – perhaps the same foibles – but they would not be the same people. Remember Bicentennial Man? I think Robin Williams' character spent the whole movie trying to do the reverse of what this guy is suggesting. Huh.